A new Glock MOS pistol. Note the attachment plate sitting in the machined slot at the rear of the slide. Though so many Glock fans were looking for the announcement of the Glock single-stack compact 9mm pistol, Glock did not feed that hunger at SHOT Show this year. I’m beginning to think that Glock won’t produce what the market demands, simply so they can maintain some kind of twisted belief that they are in charge of the market. Instead they promoted their new Modular Optic System (MOS) pistols. There has been an ever-increasing movement in many of the competitive shooting circles to have a pistol with a red dot reflex sight. The benefits of reflex sights on a pistol are perhaps even greater than reflex sights on a long gun. The reflex sights allows the shooter a much quicker target acquisition by removing the need to align multiple, often difficult to see, small sights during high stress shooting situations. The other side of the Glock MOS pistol. 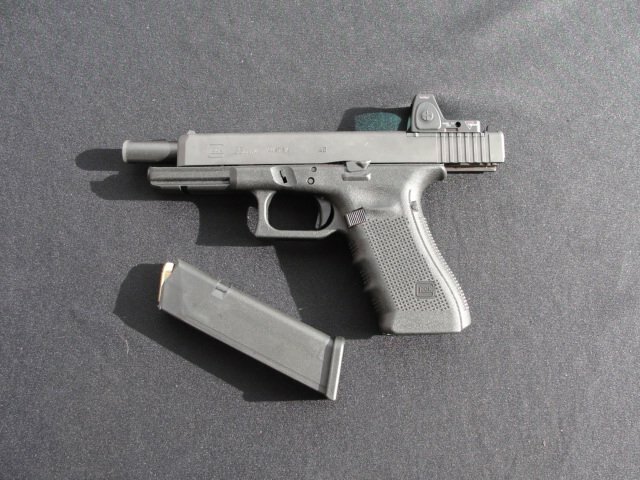 Glock engineers responded to this movement with the MOS series of pistols. With handgun shooting distances typically being in such close quarters, bore-to-sight off-set issues can have dramatic effects on shooting accuracy. If they simply added a mounting rail or other system on top of their standard Glock handguns they would only exacerbate the problem. In other words, having a red dot sight so far above the bore on a handgun really messes with the whole point of red dot optics – point and shoot. 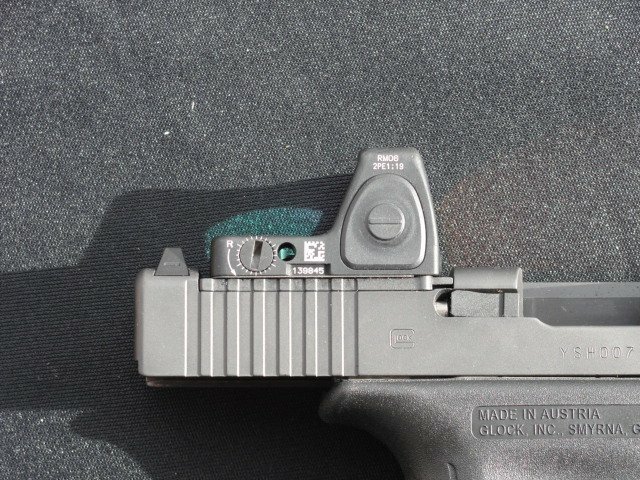 To overcome that problem, Glock engineers dug into the slide itself to provide as low of a sight setting as possible. The machined slot is shallow enough not to expose critical internal parts, while still providing a low sight axis for reflex sights. Unlike some firms that cut slides all the way through to attach mounting brackets, Glock engineers cut into the slide just enough to allow interchangeable mounting plates to be installed. Enough of the original slide metal remains to sustain structural integrity and prevent moisture or debris from entering the trigger group. The result is a fitting that is very secure. The cut in the slide is shallow enough that is does not expose the firing pin group. Not all the options on the market can make that claim. The front of the cut does get very close to the extractor but, the Glock guys said engineers were confident the slide would hold up under heavy use. The strength of the metal used in the slide, and the Glock Melonite-type finish (no longer Tenifer due to US EPA regulations on hazardous by-products) have been selling points by Glock from their beginning. Unfortunately, even with the cut into the slide, and the relatively slim profile of pistol red dot optics, the standard Glock sights will not co-witness with the red dot optic like many rifles can. The MOS sight slot does get very close to the extractor, but Glock assures the structural integrity of the slide will remain intact. 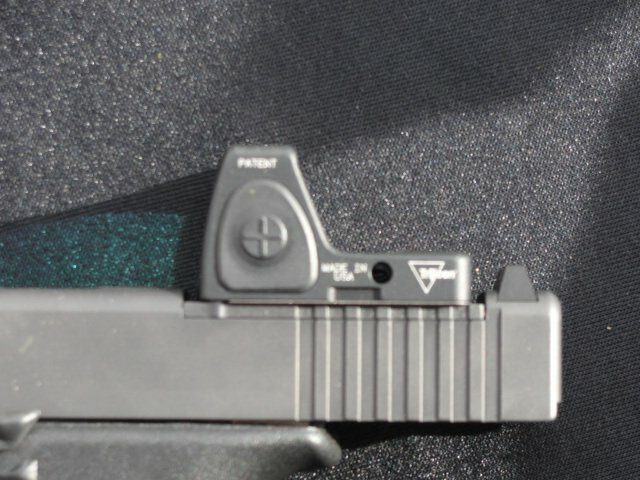 A great feature of the Glock MOS pistols is that the sight mounting plate does not remove the rear sight. If for some reason the shooter wants to remove the reflex sight, they can put in the base cover plate to enclose the slide, and still have full use of front and rear fixed sights. Plate 04 – Fits Leupold Deltapoint. The versatility of the MOS system is a great design feature that allows shooters to update or modify their red dot optic selections if desired. Simple mounting tools are all that are needed for adjustments or changes, and the sights can be switched out in just a few minutes. Glock provides a brochure explaining the mounting process and proper Plate selection with each MOS handgun. At the Industry Day at the Range during SHOT Show, Glock had MOS pistols with Leupold Deltapoint and Trijicon RMR optics. I was able to shoot a .40 S&W and .45 ACP version of the Glock MOS at the range. Shooting the Glock MOS handguns was a nice transition from the Trijicon 3-dot sights I’m accustomed to normally. Acquisition of targets was very quick, as to be expected, and finding the dot after recoil was nearly seamless with proper grip and recoil management. Accuracy at 15-yards was impressive, with follow-up shots being accurate as well as fast. Finding the red dot sight was quick and natural when a proper grip was maintained. Glock representatives explained that their system will provide as much stability as possible for the red dot optic to do its job. Earlier versions of pistol mounted reflex sights suffered from jarring during recoil, sometimes causing them to turn off, or quickly lose their zero. Glock representatives reported that red dot optics advancements are providing a much better maintenance of zero and long-term durability. I asked if there would be the option to simply purchase an MOS slide with mounting plates so a shooter could switch out with their existing Glock handgun. Unfortunately, Glock is Glock, and the answer is NO! To have the Glock MOS you must purchase an entirely new handgun. The explanation is because Glock stamps both the slide and the receiver with a serial number so they are not going to send a different serialized number item to an existing frame. I’d like to think that Glock would change their mind if the MOS takes off in popularity but, like many, I’ve held my breath for Glock before, and I’m not too interested in passing out. There are already several Level I holsters on the market that will accept the Glock MOS handguns. Talking to the Glock reps and some reps from Safariland, there will be Level II holsters ready for the Glock MOS to satisfy law enforcement or government users needs. Level III holsters are still a bit down the road, but will likely be developed as demand grows. The Glock MOS does not seem to be co-witness capable unlike the S&W CORE. The CORE comes with taller iron sights that makes co-witness possible with some of the lower optical sights that are compatible (but not all). 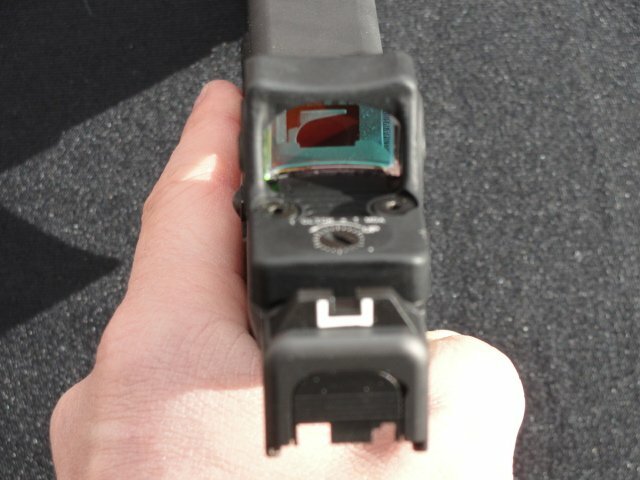 Does Glock or other companies offer taller sights for Glocks? I have a rear sight laser from Laserlyte that slides in to the rear slight slot. I think it is a real neat setup that has worked for me for over a year, though they seem to be discontinued. It might be neat if someone came out with co-witnessed optical sight system with a red or green laser, and maybe even a light built in, all in the rear. Then the pistol would slip into a standard holster. On the other hand, the slide does make for a jerky ride for all those electronics. The CORE’s are compatible with a grip laser though. So many possibilities of sighting systems, lasers, and lights! Then there is the question of caliber and barrel length, too. What’s your idea of a perfect setup? Saint, you are correct. The Glock MOS is designed to be used with the holographic sight when attached. Only when the MOS is removed are the iron sights capable of being used. However, I do believe there are after-market taller iron sights that can be installed to allow a co-witness with the MOS. I S&W CORE was definitely thinking about the fighting pistol. Sorry for the late response Saint. I misread your post originally and missed the questions. I believe Lone Wolf Distributors have taller sights for Glocks, as well as Glockmeister. They’re typically marketed as “suppressor” sights to get over the can, but should work to overcome the height issue on the Glock MOS design. And I actually think the CORE pistols have taller than standard sights to allow co-witnessing – at least the ones I’ve seen. I like the S&W CORE, because I really like the M&P line of pistols. If I were to go with CORE I would probably do a standard full-size 9mm or .40. I would not go for the extended barrel lengths. If I were a competitive shooter maybe, but as an every day use pistol I wouldn’t go any longer than standard full-length. I would not do the compact version either. However, since I carry a Glock daily (on duty and off), I would like to see the MOS expand to the standard length pistols like the G22 I carry. Then I would outfit it with a Trijicon RMR or maybe a Leupold Deltapoint. Right now I’d be stuck with the G35. Which holsters are available? Really looking at this for a duty sidearm. Aging eyes….nuff said! Thanks Aaron. Great information. Now I only have to decide if I want to wait for them to include the Glock 17, 15, 22, or 23 in this format. True Bill! And I wish I had the crystal ball to figure that out, but Glock is infamous for keeping the industry waiting. Bill your wish has come true! 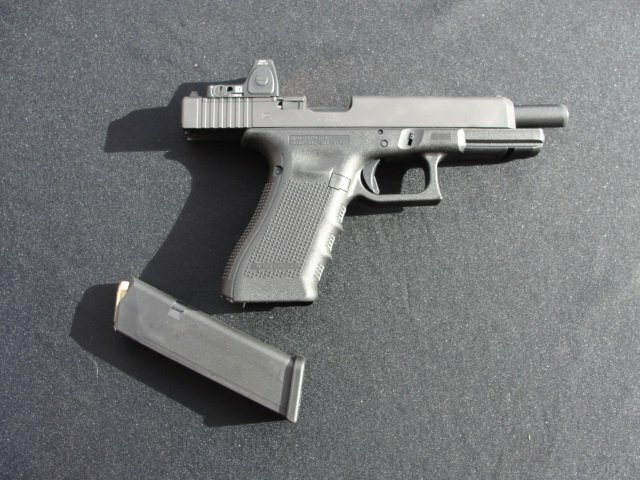 Glock has just announced the addition of the Glock 17 and Glock 19 Gen 4 MOS platforms. More to come in a follow-up article. I would imagine by next year the 22 and 23 will follow. Why hasn’t Glock made an adapter plate for mounting MOD sights on prior generation models? Seems as if they’re missing the boat for additional sales.